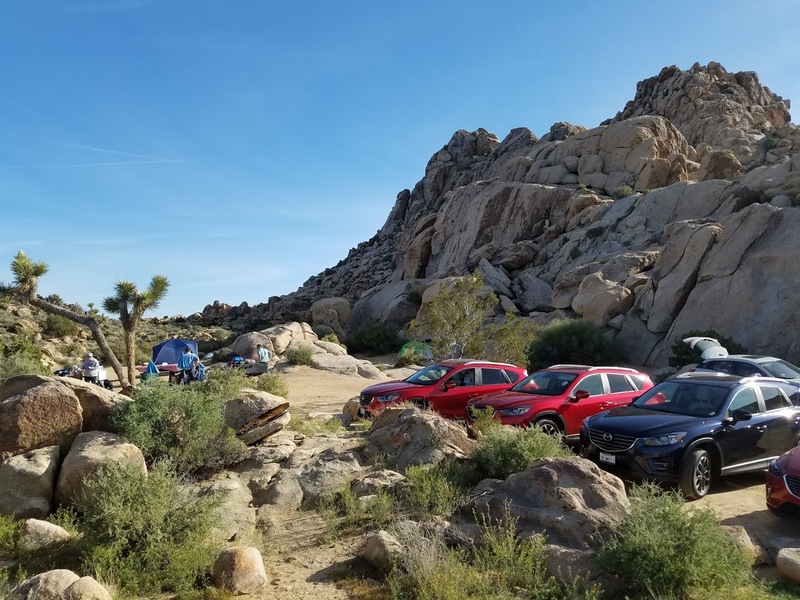 Time has really flown by since I went on a camping trip to Joshua Tree National Park with Mazda. I got to drive a CX-5 to Joshua Tree and around the area. I also got to drive the CX-3. Mazda's tagline #DivingMatters really hit home with this trip because if I did not drive I would not have been able to see all the things I saw on this amazing trip. Driving to Joshua Tree from San Diego can be rough if you hit the road at the wrong time. Knowing this we decided to leave earlier and avoid the rush hour madness! Living near the water in San Diego and seeing people out surfing in the morning and then seeing snow in the mountains just two hours away at Big Bear is still kind of shocking for this Midwest gal. Once you pass the mountains you get into the high dessert where part of Joshua Tree National Park is. You can find any last minute supplies you need for camping right before the entrance with a couple stores and marts. The CX-5 can sure hold a lot! I packed it with all the food for twelve people for 2 nights plus camping chairs and countless other items. 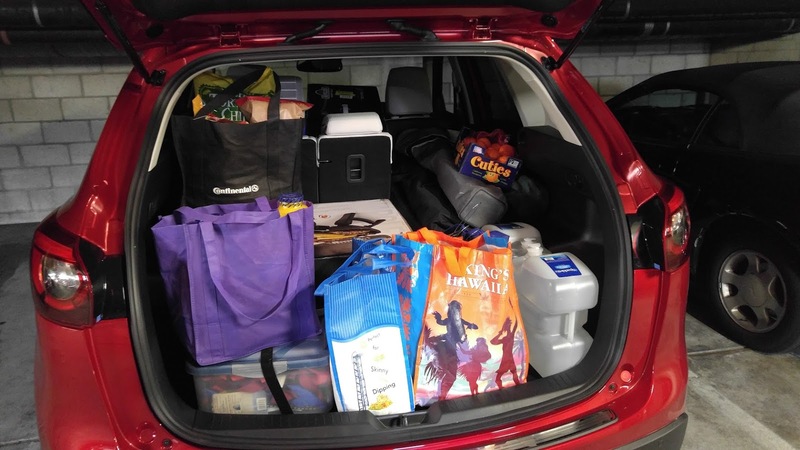 (see picture of how packed I got the CX-5) Even being packed to the brim with no space left the car still drove like it did when nothing was in it and that was very smooth! Once in the Joshua Tree there are some curvy roads that are fun and the scenery is beyond anything I can explain here or even show. It is just that beautiful that you have to see in person just like the CX-5. You can see any car and say yeah it looks nice but to really see what is in it you need to take it out on the road and test it. We stayed at the Sheep Pass group campsite since there were many of us and as you can see 7 Mazdas! The next two days were going to be filled with beautiful sights along with the strange all while driving your choice of Mazda for the day. The first day my hubby and I decided to stay in Joshua Tree and visit all the sites and drive on some of the dirt roads in the park. Pro Tip 1: there are some dirt roads that lead to some great hiking spots. 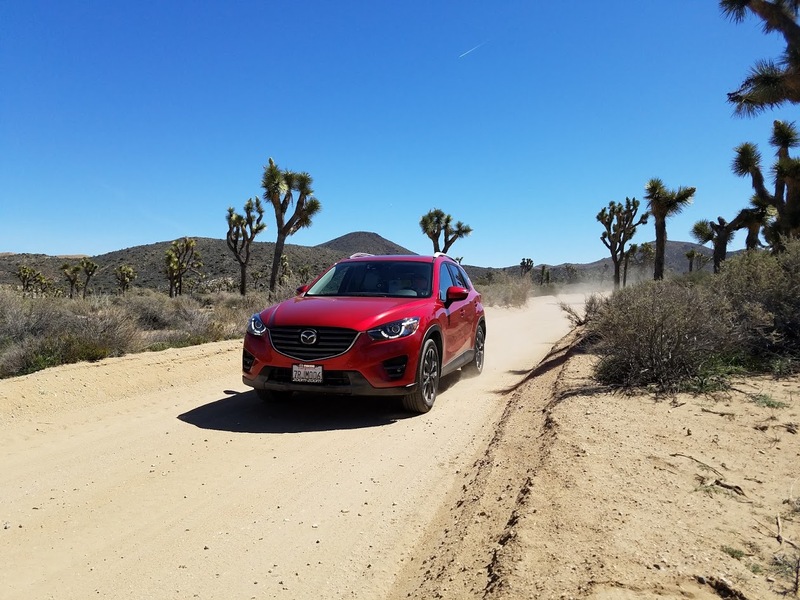 The CX-5 handled the dirt roads just as it did on the pavement. We also visited Keys View which has an amazing view of the whole Coachella Valley including Palm Springs, Indio, and even the Salton Sea! The other cool thing about this spot is that you can see the San Andreas fault line. Pro Tip 2:pack extra warm clothes and warm sleeping bags. I actually thought I did this but I really needed to pack more it really does get colder then you think in the desert at night! The next day we packed up our camping gear and headed to the Salton Sea where there are many things that are unusual. Most of the area looks like a post apocalyptic area with dilapidated homes and dead fish along the shore. One thing I loved was the International Banana Museum. You could see lots of banana memorabilia and even have a banana shake but since I am dairy free I tried a banana soda which was very good. Another highlight was Slab City which was once a marine base but now is empty land where people with trailers and other squatters come to live in harmony. You can see sights such as Salvation Mountain and East Jesus which are all located within Slab City. It is definately unique and it makes you wonder how these people live out there with no electric, water, and sewer. As we headed back through the park I drove the CX-3 which is such a fun sporty car where you feel one with road. It really has some great pick up and go and had a really cool feature called heads up display which shows you your speed without looking down. It is a great little subcompact crossover. Driving really does matter because if I had not driven I could have never have had these experiences that will last with me for years to come.